The New Celebrity Apprentice star Arnold Schwarzenegger "terminated" Chael Sonnen for breaking the rules and Porsha Williams for being the weakest member of her team during the second half of Monday night's two-hour episode on NBC. The world-famous athlete, actor and former California governor fired Chael for cheating during a task, while Porsha was sent packing once she was deemed responsible for her co-ed "Prima" team's loss in the season's eighth task. The drama kicked off with Arnold approaching the two teams with a new task. At this point in the season, "Arete" featured ESPN sports analyst and former NFL running back Ricky Williams, Grammy Award-winning singer and songwriter Boy George, American Ninja Warrior host Matt Iseman, former Dancing with the Stars co-host Brooke Burke-Charvet, and retired undefeated American pro boxer Laila Ali. "Prima" was comprised of Chael, a retired American mixed martial artist; Porsha, a star on The Real Housewives of Atlanta; television star and celebrity stylist Carson Kressley, and former pro basketball player and three-time WNBA MVP Lisa Leslie. Due to a prior engagement, Boy George could not participate in the eighth task, which required the teams to create a celebrity-inspired digital brochure to promote The Wizarding World of Harry Potter in Hollywood's Universal Studios. The presentations had to cater to fans, and the teams were judged on creativity of theme and concept, brand integration and live presentation. The winning team's project manager would receive $50,000 for his or her selected charity. Although hesitant, Carson stepped up to lead his "Prima" team. Matt, on the other hand, jumped at the opportunity to be project manager for Arete because he's passionate about Harry Potter. Once in the boardroom with Arnold's nephew Patrick Schwarzenegger and Tracey Edmonds, a businesswoman and Extra's host and producer, serving as advisers, Arnold wanted to discuss each team's strengths and weaknesses in the task at hand. But before diving into the results, Carson felt it was only fair to speak up about a teammate's misbehavior. Carson revealed that right when his team was about to run out of time creating its brochure on the computer, the power went out and Chael could be seen lying on the floor with scissors. Lisa said she wasn't sure whether Chael was trying to sabotage their project or buy them time. When Arnold asked Chael to explain himself, the athlete said he did not cheat, and in fact, followed the rules and made a great move. Chael said a team can only be granted more time if there's a "technical difficulty," so he created one in order to buy his team the 10 additional minutes they needed to finish the brochure -- which wouldn't have been finished otherwise. Chael said he saved a 50k task by cutting a 30-cent cord. Patrick noted that "technical difficulties" cannot be caused by the contestants themselves, and then Arnold -- despite acknowledging it's a gray area -- fired Chael because he does not "tolerate cheaters" in the boardroom. "Our team would've been out on a technicality last night. I bought them 10 extra minutes, so they came back and said, 'Hey, here's an opportunity to get rid of him, a good player.' It's a game. I respect what they did; I respect how they carried it out. Hats off," Chael said following his ouster. Arnold then resumed conversation about the task. The Universal Studios executives thought Matt had incredible showmanship for team "Arete" as well as knowledge of the brand. They appreciated his enthusiasm and the newspaper's creativity. The brochure was great overall and the executives loved it. As for "Prima," the executives thought their creativity was predictable and the presentation uninspired. Prima apparently missed the mark right out of the gate. In the end, "Arete" won the task, and Matt -- who was the only project manager to win twice this season -- received $50,000 for his Arthritis Foundation charity. It soon came to light that while Carson pushed the creative direction of the task and led his team to a failure, he was a stronger player than both Porsha and Lisa. The girls bickered back and forth about who deserved to be fired, and Porsha called Lisa out on telling alleged lies about her performance. Carson didn't give Arnold a clear answer on whether Porsha or Lisa deserved to be terminated. However, Arnold determined it wasn't time for Carson to go since he's an "extraordinary player" overall and won previous tasks. Lisa, on the other hand, lost six of the eight tasks and had trouble answering questions directly about whom should be fired instead of her. She also had a hand in the creative aspects of this particular task as well. Arnold therefore decided Porsha was the least valuable player on her team at this point. "Porsha you are terminated," Arnold said. "I wish I would've been able to get some money for my charity Hosea Williams Feed the Hungry and the Homeless, but being fired is pretty intense. 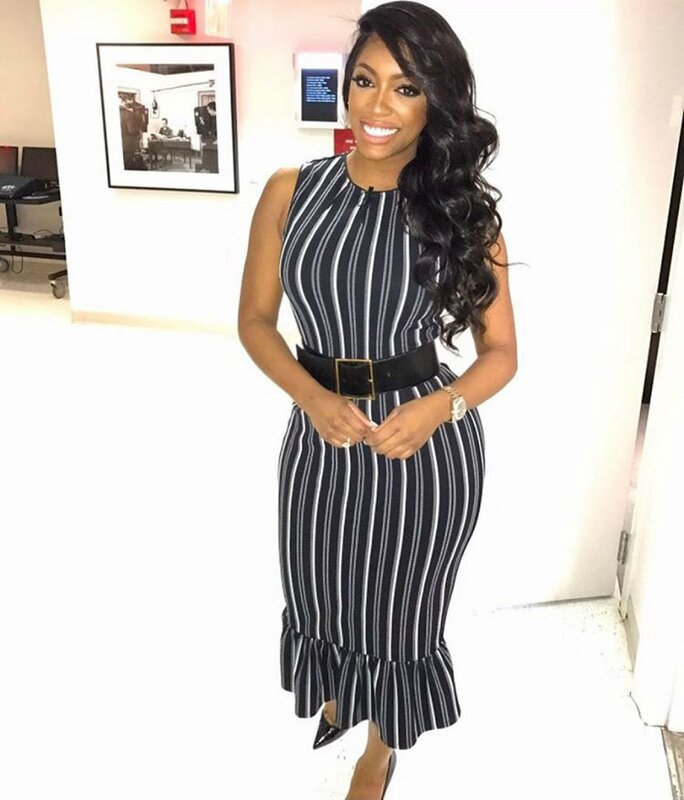 I knew the choice words I had in mind that I wanted to say were not good, so I just decided to be quiet like my mama told me, 'If you have nothing nice to say, then close your mouth," Porsha said following her ouster.